MasterCard (s ma) isn’t standing by while rivals such as Visa (s v) and American Express (s axp) move forward with their own wallet apps. The credit card company is rolling out the first trial of its QkR mobile application, a mobile payment app that allows people to interact and initiate payments via QR codes, NFC tags and other technologies. MasterCard is working with Australian cinema chain Hoyts and Commonwealth Bank on the first pilot of its QkR app (pronounced quicker), which I first wrote about in September. 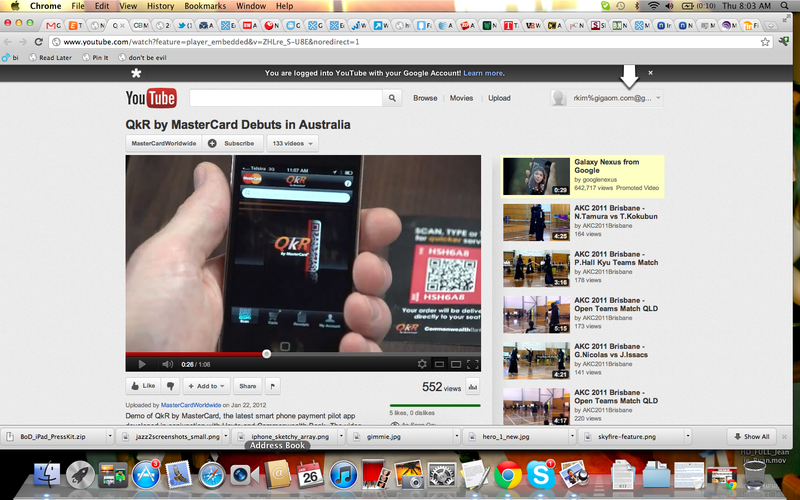 Visitors to high-end Hoyts movie theaters will now be greeted by QR codes and NFC tags on their seat armrest. Using the QkR app, available on both iPhone (s aapl) and Android (s goog), they can scan the QR code, manually enter in the code or tap their NFC-enabled phone on the NFC tag, which pulls up a menu of food items. Users can then pay with a preloaded credit or debit card and their food will be delivered right to their seat. It’s a nice way to avoid lines and get some better service in a movie theater. But QkR also shows how MasterCard is looking to leverage mobile apps, NFC and QR codes to build out a payment system that can work in a variety of settings. The QkR app can work for businesses and restaurants, allowing consumers to grab discounts or menus with a scan or tap, and help them check-out right through the app. That can help businesses to be more efficient in letting users order and pay when they want to but it also opens up more channels of communication so a merchant can establish a relationship with their users. Last fall, MasterCard also showed off how QkR can work through TV shopping shows that display QR codes onscreen or through commercials that can send out high- and low-frequency signals that can prompt the QkR app to pull up information. It can even be used in conjunction with Xbox Kinect (s msft) for TV-based transactions. 2012 is lining up to be a big year for mobile wallets: Be prepared to get hammered over the head with that term. But there are still some differences in the way each one operates. MasterCard is really trying to leverage a variety of technologies with its mobile payment app so it can be used both in-store and in the living room as well. It’s also partnering with other wallet initiatives like Google Wallet. I can see why some businesses and restaurants are curious about QkR, though we’ll have to see who actually deploys it here in the U.S. However, it also reminds me that many retailers and businesses are going to be confused as to which of these payment services they want to support. With so many options from Google Wallet, Isis, PayPal (s ebay), V.me from Visa, and others, it’s not clear which one may make the most sense for businesses. That will be one reason, beyond hardware upgrade concerns, why mobile payments may take some time to take off this year: it’s just going to be confusing (subscription required) with all the different mobile wallets popping up.